The enclosure casing is made of quality engineering plastics, and of good performance of anti-erosion against acid and alkali salt, anti-aging, as well as smooth appearance and reliable mechanical structure. The mechanical structure is reliable and has the performance of resisting wild environment and intensive climate changes and serious working environment. The protection grade reaches IP66. 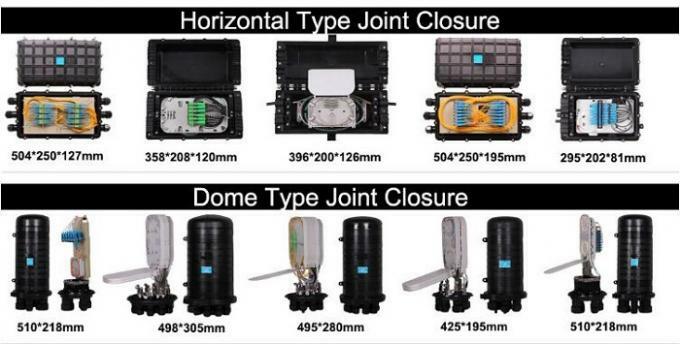 The closures are applicable to ribbon type optical cable and common optical cable. The splice trays inside the closure are turn-able like booklets, and have adequate curvature radius and space for winding optical fiber to make sure the curvature radius for optical winding 40mm. Each optical cable and fiber can be operated individually. The closure is of small volume, big capacity and convenient maintenance. The elastic rubber seal rings inside the closure are of good sealing and sweat-proof performance. The casing can be opened repeatedly without air leakage. No special tools are required. The operation is easy and simple. The air valve is provided for the closure and used to check the sealing performance. Seal performance: after the box is sealed, inflate to 100kPa inwards (inflation only apply to the models with the air hole), and then soak it in the water of normal temperature, after 15 minutes of steady observation, there is no bubble to overflow. Insulation resistance: the insulation resistance between the metal work piece and the earth is greater than 20kMΩ. Pressurization: there is no breakdown or flashover under 15kVdc/1min between the metal work piece and the earth. The curvature radius of the fiber 40mm, without extra loss inside the splice tray. It can bear the axial tensile strength no less than 1000N. Other performances are all in accordance with the requirement of standard YD/T814-1998. Testing deepness: place the whole closure into water. Place closure in the water environment with NaCl’s concentration of 5%. Can install splitters to the closure (if there is special requirement). For some small capacity closure (under 48 cores) used for Branching to subscribers can require for ODF mini and integrate splitters inside. The closure cover can sustain affect of ultraviolet ray without broken or changing color.